A crowd of Fordham Law students and alumnae gathered at Bar Boulud on April 2 for the annual Alumnae Reception hosted by Fordham Law Women. At the event, the founder of the group, Betty Santangelo ’74 presented the inaugural Betty Santangelo Award to Kathleen Walsh ’89. Fordham Law Women has undergone an impressive revival over the last three years. Founded by Santangelo in the 1970s to empower women at the school, the group became inactive in the 2000s. In 2015, a group of students revived it; the group now counts over 300 members ranging across all three years of the school. 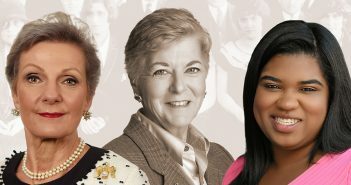 This year, in honor of the 100 Years of Women at Fordham Law, the group has instituted the Betty Santangelo Award to honor an alumna who is sponsoring meaningful advocacy for women in the legal industry. A renowned mentor for young women lawyers, Betty Santangelo is a partner at Schulte Roth & Zabel, where she focuses on white-collar criminal defense and securities/bank enforcement. Santangelo is nationally recognized for her expertise in corporate compliance issues. She is also a member of Fordham Law’s advisory board and a former adjunct professor at the school. Fordham Law Women co-presidents Kara Krakower ’19 and Kristine Itliong ’20 then introduced the winner of the inaugural Betty Santangelo Award. Kathleen Walsh, a partner in the New York office of Latham & Watkins, graduated from Fordham Law in 1989. She also attended Fordham as an undergraduate student. She teaches “Fundamentals of Private Equity Fund Formation” at Fordham Law. In 2014, she was named Best in Investment Funds and received industry recognition by Euromoney Legal Media Group for Women in Business Law Awards. Walsh said that she arrived to Fordham Law 15 years after Santangelo graduated, and that by that time women represented a large percentage of the student body. “We had great female professors,” she said, as she mentioned one of her favorite professors, Prof. Helen H. Bender. FLW Co-President Kara Krakower said the criteria for the award include being an advocate for women involved with Fordham Law; being involved with women in law groups; being an active mentor of young women and law students; and being involved in women’s groups generally. The event was part of the celebrations for the 100th anniversary of the opening of Fordham Law to women students.